Click here to read the Katy Home Journal, May 2018 edition. Welcome to the May/June 2018 edition of the Katy Home Journal! 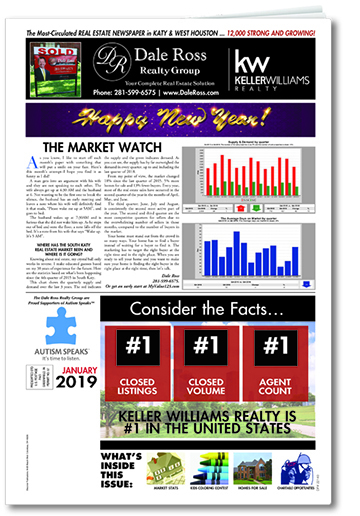 In case you missed it in your mailbox, you can keep up with the Katy Home Journal here.. We've published a ton of great information about Katy, homeownership, finance, and more. As always, on the front page you get a "fantastic" joke as well as my take on the real estate market. Page three brings you an update on those properties flooded by Harvey. In addition, check out the area market stats, some of our beautiful listings. and for the kids, a coloring contest on page 5. We hope you enjoy reading our paper as much as we've enjoyed publishing it. Let us know your thoughts. Kick back with your favorite beverage and enjoy the Katy Home Journal. Thanks, Katy!